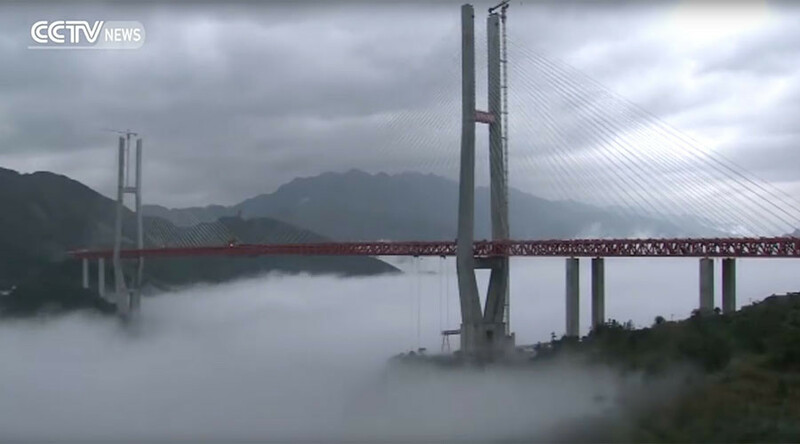 Standing more than 20 meters higher than One World Trade Center in New York, the world’s highest bridge has officially opened to traffic in southwest China. The Beipanjiang Bridge, which connects the mountainous provinces of Guizhou and Yunnan, has claimed the title of world’s highest bridge from another Chinese feat of engineering, the Sidu River Bridge in Hubei province. The bridge, with a height equivalent to a 200-storey building, cuts travel time from Liupanshui in Guizhou to Xuanwei in Yunnan from around five hours to under two. Construction of the 1,341-meter-long suspension bridge began in 2013 and ran to a final cost of approximately 1 billion Yuan ($144 million). State-run Chinese media organization CCTV reports that strong winds in the valley posed a problem for engineers in designing and building the massive structure. The engineers overcame the issue by assembling all parts of the bridge on site, giving them a higher degree of precision throughout the final phase of construction. Several of the world’s highest bridges are in China, however the world’s tallest bridge is France’s Millau viaduct which stands at 270 meters tall.